In 1951, Harley-Davidson Servi-Cars were upgraded to hydraulic rear drum brakes. The rear brakes remained the same until 1973, when rear disc brakes were fitted. This article covers rear Servi-car brakes found on 1951 through 1972 models. 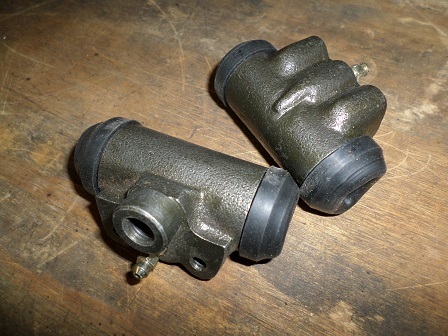 Many rear Servi-car brake parts are the same as 1948 thru 1963 Willys Jeeps. Harley-Davidson did not make these parts, they bought them from an outside source. 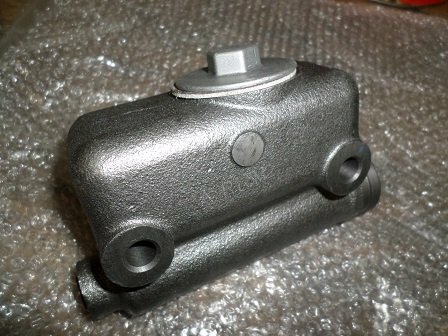 These parts include the master cylinder, wheel cylinders, and brake shoes. I have learned through experience that there are more (and better) Classic Jeep suppliers than there are Servi-car suppliers. To take off the rear drum, first remove the castellated axle nut and cotter pin. Do not try to bang off the drum with a hammer if it doesn't come off easily - it's a tapered fit on the rear axle. 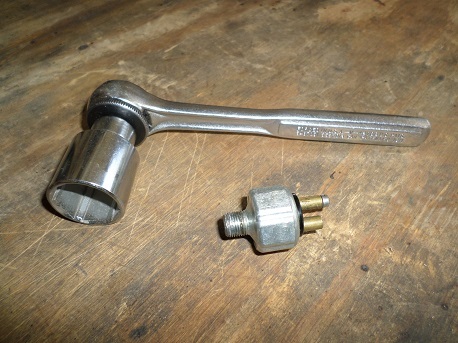 You will need to use an appropriate puller to remove the drum - a slide hammer with puller attachment works well. 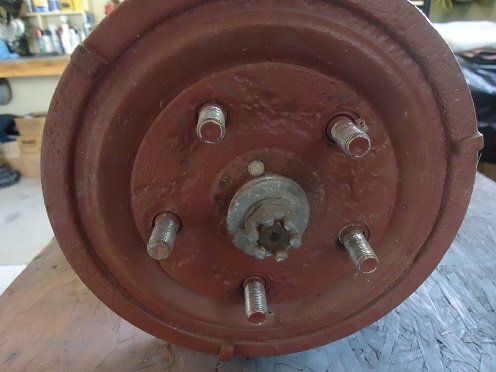 Once the brake drum is removed, you will find an axle shaft spacer behind the drum. There is also a 1/4" square key that fits into a slot on the axle shaft. Applying a thin coating of anti-seize on the end tapers would be a good idea when re-assembling. 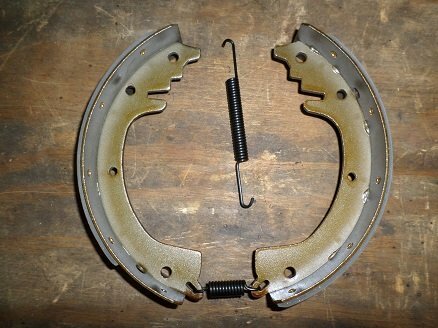 The rear Servi brake shoes are 9" x 1-3/4". They are the same as the 1948 thru 1963 Willys Jeeps. Same as shoes that fit Willys model M38A1 (part #807376). Brake shoe hardware for 1951-1972 Harley Servi-cars includes one (long) return spring on the top and one (short) retainer spring on the bottom for each side. There are also four brake shoe hold-down clips, two for each side (one for each shoe). If needed, shims are may need to be installed behind the rear backing plates. These are a "use as required" part to correctly space the backing plates from the flange mounts on the axle tubes. Kaiser Willys Auto Supply is an old Jeep parts company that (unknowingly) sells Servi-car brake parts. I've gotten parts from them on several occasions, always with good results. To install the rear shoes, first attach them at the bottom with the shorter spring. Then install the hold-down clips. Next, line up the brake shoe "ears" into the sides of the wheel cylinder. You will need a pair of brake spring pliers to install the top (longer) spring. No longer available from Harley-Davidson, the master cylinder can still be obtained through most auto parts stores. The aftermarket Wagner part # FE2693 fits 1951-1972 Harley trikes, as well as 1948 thru 1963 Willys Jeeps. The center-to-center bolt hole length for the Servi master-cylinder is 3-7/16". Note that earlier 1941-1947 Jeep master cylinders are nearly identical, but have a bolt center length of 3-1/8" and the front mounting hole is threaded. They would work on the Servi-car, but would not fit the frame bracket correctly. Rear wheel cylinders for the Harley 45 trikes have a 7/8" bore and are the same from 1951 to 1972. You may still be able to order them from an auto parts store. You can buy or fabricate steel brake lines. 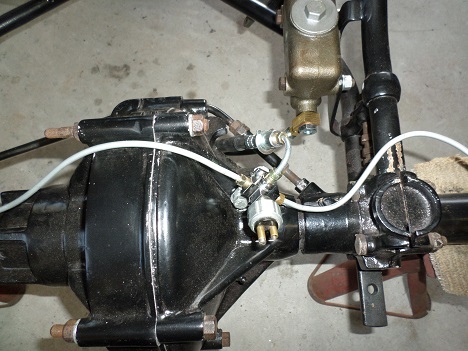 Three are needed, left-side, right-side, and master cylinder to junction block. There is a rubber brake hose runs from the back of the master to a four-way junction block mounted to the rear axle. Also on the junction block is a hydraulic stop-light switch, which lights up the brake lights when pressure is applied. The right-side foot-brake linkage connects the front foot lever to the rear pivot bracket. 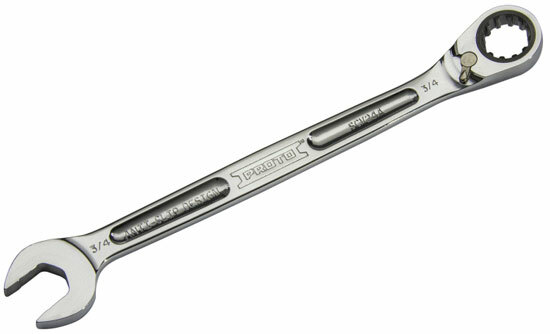 It is comprised of pivot lever OEM# 83525-51, pivot bolt #83528-51 (with grease fitting), and clevis pin kit #42269-30. Because the Servi-car master cylinder sits lower than the wheel cylinders do, bleeding brakes by gravity is not possible. So here was my second choice. Attach a length of 3/16" clear tubing (from an aquarium pump or something similar) to the bleeder screw, and submerge the other end into a clear container filled with a couple inches of brake fluid. Doing one side at a time, open the bleeder, and depress the pedal. Close the bleeder before you release the pedal. Repeat this procedure until you get fluid with no air bubbles, then go to the other side. Go back to the first side and check that no air from the other side entered that line. If your master cylinder is in good condition, bleeding the brakes should only take 10-15 minutes. 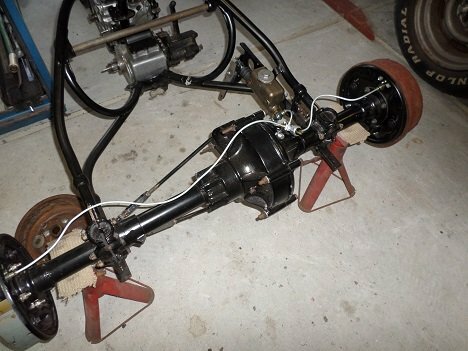 With the back of the trike up on jack stands, rotate the rear wheels and check for excessive drag. The brake rod should be adjusted so the brakes don't take effect until the foot pedal is about an inch down. When properly adjusted, the brakes should be fully applied before the foot pedal goes all the way down.